Establishing a lawn from seed can be a rewarding experience and a less expensive option in comparison to sod. While establishing a lawn from seed can be done at anytime of the year, there are a few things to consider when considering seeding a lawn in the spring. If a pre-emergent fertilizer was applied to your lawn to prevent crabgrass and other weed seeds from germinating the same will happen to newly planted grass seed. 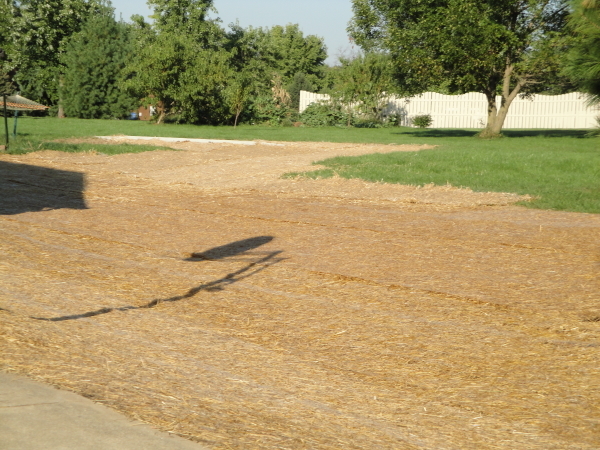 Therefore, you will need to scratch the surface of the ground exposing the dirt which will disturb the pre-emergent barrier and allow your grass seed to germinate. If your lawn has not been fertilized yet, you will need to pick a blend of fertilizer without a pre-emergent control. If you use a lawn care provider be sure to inform them that you plan to seed in the spring and they will use a starter fertilizer blend without a pre-emergent herbicide. Springtime weeds will seem to grow anywhere and everywhere and will grow faster then grass seed. First reaction may be to use your favorite herbicide to control those weeds, but hold off at least 60 days from the time the seed was planted or until the newly planted seed areas have been mowed at least 3 times, which ever is the later to make sure it is mature enough for weed control products. During the summer drought months established lawns will be able to go dormant and then bounce back during the fall, but areas seeded during the spring may not be developed enough or have a deep enough root system. Consider extra watering to these areas during those periods of lack of rainfall. Seeding a lawn can be done at anytime during the year; however there are things consider such as types of fertilizer to use, control of weeds and additional watering requirements during the summer months. In addition to the above information, please visit our blog on taking care of a newly seeded lawn. As always a good idea to consult with a lawn care professional and ask any questions you may have. Look around, ask friends or family, and research companies on the Better Business Bureau to find a company that you can trust.